We hear about the strides being made in the "new world" with Pinot Noir, so I assembled a somewhat random set of wines from the Southern Hemisphere. I included two wines from favorite producers, Ata Rangi of New Zealand and EQ from Chile, hoping these would provide a benchmark. 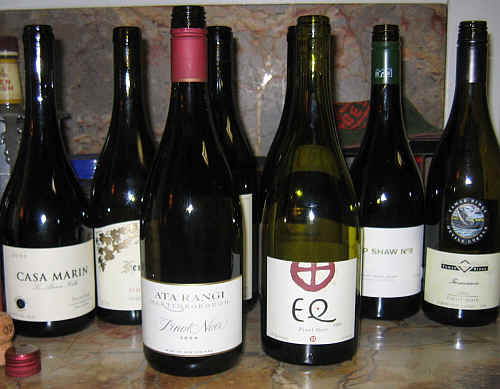 I had two Australian entrants...three if you want to count the Tasmanian Pinot. 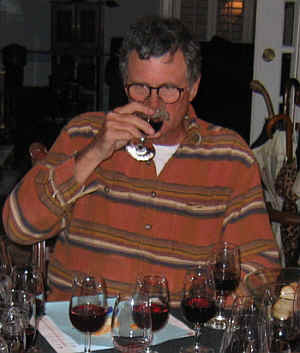 We had three from three wines from New Zealand and a pair of Chilean Pinots. The two "benchmark" wines finished at the top, out-distancing the rest of the field handily. I felt many of the wines displayed a good level of varietal character. 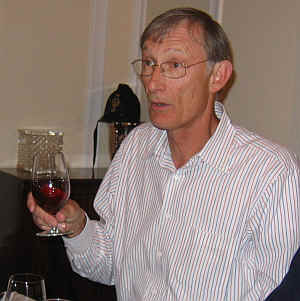 The common thread that ran throughout the wines perhaps caused the leaders to appear less distinctive than they might have shown in different circumstances. Many tasters pointed out that this, as usual for a Pinot Noir flight, was a difficult tasting to rank. Half of the set of wines had a first place vote and half had a last. This wine showed more its geographical heritage than intense varietal character. Call it terroir if you like, but this wine has an aroma I immediately associate with Australian wines: candied violets and perhaps a mildly resinous tone reminiscent of eucalyptus. My overall impression of this wine was that it's more similar to a gamey Gamay. Think of a Beaujolais with Aussie terroir. It's not an unpleasant wine, but if you're looking for "Burgundian" sorts of elements in a Pinot Noir, you won't find them here. I certainly can't defend the $42 price tag for this sort of wine. Sorry. No stars on my three star scale, meaning this is a rather standard quality bottling. I can understand the perspective of some tasters not finding this wine to be quite as charming as others. Its overall theme leans towards the vegetal end of the spectrum, rather than the fruity side. Still, these notes are typical of Pinot Noir, frequently. The wine is a medium-bodied Pinot with herbal aromas and flavors. I also detected hints of a loamy character on the palate. Nice now and probably for a couple of years. One star, but the price is significantly higher than I'd be willing to pay. While this wine has definite Pinot Noir character, the more dominant feature of the wine is its brown spice notes. Some Pinots and Burgundies are described as having "Asian spices," but this wine has even more notes of "sweet" spice. Clove and nutmeg add to the herbal mix of Pinot Noir. It's a medium-full bodied Pinot Noir and there's a nice "plush" texture to this wine. I found it to be almost too much in the "style" column and not quite enough in the "varietally correct" department. I'd give it a one-half star rating, but for some consumers this will certainly be viewed more favorably. It's mildly tannic, but I'm not sure it has much cellaring potential. The strawberry fruit aromas come through on the nose and the same flavors show on the palate. This is a well-made wine, but it's more similar to a nice Beaujolais than it is to good, village-level Burgundy. It's quite drinkable and a very pleasant bottle of wine, though. I'm not awarding it any stars as a Pinot Noir, though, since it's but a pleasantly fruity, light red wine. I'm sure it would be a delight with a picnic lunch on a warm, summery day. Here's a wine which sends confusing signals. One one hand, the color is very youthful, despite the wine being older than most of the others in the tasting. 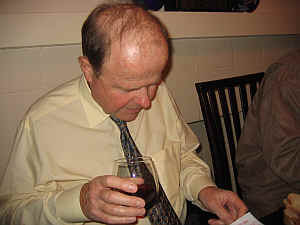 On the other hand, the nose shows an oaky, woody element and a lack of vitality to the Pinot Noir fruit, suggesting it's an older, more mature wine. 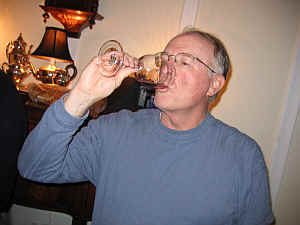 I was not certain the wine was totally dry, though, another bit of confusion for my palate. Some tasters found it "off" on the nose, being smoky. A few said they encountered notes of sulfur in this wine. For me, its central theme was merely oak, wood and more oak. There's a suggestion of hickory on the palate. I didn't find it to have more than a touch of Pinot Noir fruit, so I dropped it in my rankings. I'm not interested in paying $60 for this, either, especially since I did not award it even one star. The EQ Pinot won a previous tasting a few months ago and we'd enjoyed this when we tasted it in early March. The nose displays nice vanilla bean and mocha tones with good cherry fruit and a touch of spice. It's a medium-bodied Pinot Noir, showing nice oak and deep fruit. Sweetly-wooded, it's got some depth and nice balance. At the last moment, I ranked this up from second place to my top ranking. Two stars. Very fine. Delicious!! I had this ranked first from the start and only at the last moment dropped it down to second place. The color is medium garnet and the nose shows plenty of dark cherry, Pinot Noir fruit. There's nice toasty tones from the oak and a hint of Asian spices. It's a medium+ bodied Pinot Noir. The cherry fruit comes through nicely on the palate and these are backed by some woodsy notes. Very fine and quite good. One-and-a-half to two stars.